Q: What has your favorite part of this season been? A: My favorite part of the season so far would be when our article on ESPN was published. To have the program be recognized on a national level is incredible, and being in the NAIA versus NCAA, it means a lot to get that kind of coverage. Q: What’s the biggest challenge the softball program faces? A: Being only our second season, it has been difficult to develop a sense of leadership on the team. There are only two juniors on the team, Cassie Cook and myself, and we’re facing teams that have established leaders and culture. It’s a process, and I think the coaches are setting some strong foundations for the future. Q: How long have you been involved in softball, and how did you initially get started in it? A: I’ve only been playing since eighth grade, so about eight years. Most people start with T-ball or little league, but I got my start later on. One of my volleyball friends played softball, and I decided to give it a try. Q: What made you decide to play in college? A: When I found out I had the opportunity to play my sophomore year, I couldn’t turn down the chance. In high school, I never tried getting recruited by colleges; I focused purely on academics. I missed being on a team and that competitive spirit my freshman year, so it was an easy decision to make when I was offered a spot on the team. Q: Do you have any people that you look up to? A: My coaches through middle and high school were amazing. They believed in me and helped me develop the skills I needed to really enjoy the sport. I have them to thank for giving me a chance. Q: How have you balanced your softball schedule with school and other responsibilities? A: It has been difficult, but I am used to a crazy busy schedule. Before I joined the program, I would have class, a part-time job and a few student orgs. where I committed my time. It takes a lot of time management and determination to balance it all — and a bit of sleep deprivation. A: I like to catch up on pop culture — a.k.a. watch Netflix, and troll style and entertainment blogs — try new foods and recipes, and go kayaking when I can. 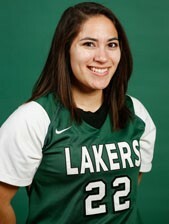 Q: What’s your best memory of Lakers softball so far? A: My best memory would be when we played an exposition game in the fall, and I had two great catches in left field — one that saved a triple. It was my first fielding start, too. Q: When you’re done at Roosevelt, what’s your dream career? A: My dream career would be to work as a planner for an ad agency or working in media, like writing for Saturday Night Live.